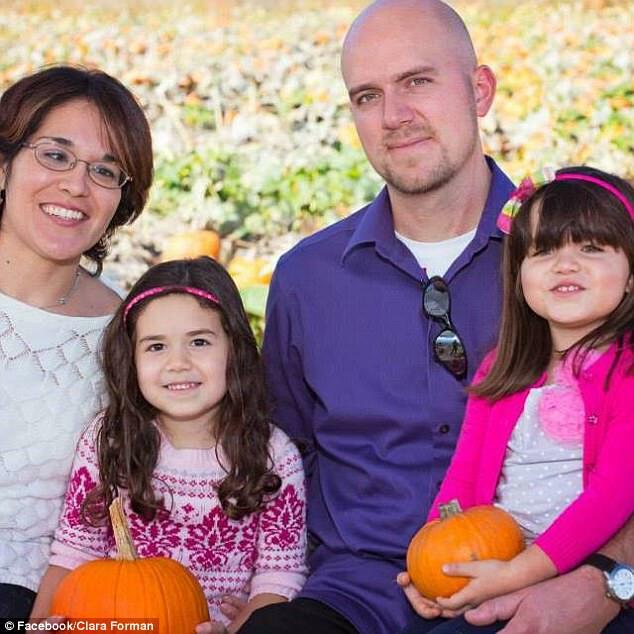 A Canadian father has been charged with murdering his wife and his two young daughters. Jacob Daniel Forman, 34, was charged with three counts of second-degree murder after the three bodies were found inside the family's Kelowna home on Tuesday. Police have not revealed how his wife, Clara, and two daughters, eight-year-old Karina and seven-year-old Yesenia, were killed, but court documents show the murders appear to have been committed on Sunday. According to CTV Vancouver, Clara and Jacob met and were married in Mexico, where Jacob was training to become a pastor at the time. The couple then moved to Kelowna about 10 years ago, and Clara became a fitness instructor. Jacob is a supervisor for a plumbing company and a devout Christian with a leadership role at his small church. David Patchell-Evans, founder of GoodLife Fitness, where Clara worked, said she was a beloved fitness instructor and offered his sympathies to friends and family members in a statement. Jacob appeared in court on Thursday where the judge ordered him to be held in custody, according to Global News. He will return to court via video link on January 18. His lawyer, Glenn Verdurmen, addressed the charges outside the courthouse on Thursday. 'Obviously he's facing the worst possible thing he could be facing at this point in time,' Verdurmen told CTV Vancouver. A memorial has been assembled at the family's home with neighbors placing teddy bears and flowers outside. 'They were just very nice people,' care-aid Gail Baran, who works next door to the Forman home, told Global News.